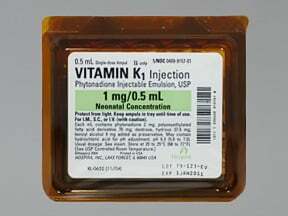 The injectable form of vitamin K can rarely cause severe (sometimes fatal) allergic reactions when given by injection into a muscle or vein. Therefore, vitamin K should be injected into a muscle or vein only when it cannot be given by injection under the skin or taken by mouth, or when your doctor has judged that the benefit is greater than the risk. Seek immediate medical attention if you experience symptoms of an allergic reaction such as rash, itching, swelling, dizziness, or trouble breathing. Who should not take Vitamin K1 Ampul? Vitamin K is used to treat and prevent low levels of certain substances (blood clotting factors) that your body naturally produces. These substances help your blood to thicken and stop bleeding normally (e.g., after an accidental cut or injury). Low levels of blood clotting factors increase the risk for unusual bleeding. Low levels may be caused by certain medications (e.g., warfarin) or medical conditions (e.g., obstructive jaundice). Vitamin K helps to treat and prevent unusual bleeding by increasing the body's production of blood clotting factors. If you are giving this medication to yourself at home, learn all preparation and usage instructions from your health care professional. The solution is normally clear and yellow in color. Before using, check this product visually for particles or discoloration. If either is present, do not use the liquid. Learn how to store and discard medical supplies safely. If you are using a certain "blood thinner" drug (warfarin), vitamin K can decrease the effects of warfarin for up to 2 weeks. Therefore, be sure to take your vitamin K and warfarin exactly as directed by your doctor or pharmacist. If you develop easy bruising or bleeding, seek immediate medical attention. You may need another dose of vitamin K.
What conditions does Vitamin K1 Ampul treat? Pain, swelling, or soreness at the injection site may occur. Temporary flushing, taste changes, dizziness, rapid heartbeat, sweating, shortness of breath, or bluish lips/skin/nails may also rarely occur. If any of these effects persist or worsen, tell your doctor or pharmacist promptly. List Vitamin K1 Ampul side effects by likelihood and severity. Before using vitamin K, tell your doctor or pharmacist if you are allergic to it; or if you have any other allergies. This product may contain inactive ingredients, which can cause allergic reactions or other problems. Talk to your pharmacist for more details. Before using this medication, tell your doctor or pharmacist your medical history, especially of: blood disorders, kidney disease, liver disease. This product may contain aluminum, which can rarely build up to dangerous levels in the body. The risk may be increased if this product is used for an extended time, especially in people with kidney disease. Tell your doctor right away if you notice any symptoms of too much aluminum in the body such as muscle weakness, bone pain, or mental changes. What should I know regarding pregnancy, nursing and administering Vitamin K1 Ampul to children or the elderly? Some products that may interact with this drug include: "blood thinners" (e.g., warfarin), nonsteroidal anti-inflammatory drugs-NSAIDs (e.g., ibuprofen, naproxen). Aspirin can increase the risk of bleeding. However, if your doctor has directed you to take low-dose aspirin for heart attack or stroke prevention (usually at dosages of 81-325 milligrams a day), you should continue taking it unless your doctor instructs you otherwise. Ask your doctor or pharmacist for more details. Does Vitamin K1 Ampul interact with other medications? Laboratory and/or medical tests (e.g., prothrombin time, INR) should be performed to monitor your progress or check for side effects. Consult your doctor for more details. Vitamin K is commonly found in leafy green vegetables such as spinach, collards, and broccoli. Follow any dietary guidelines recommended by your health care professional. Store at room temperature away from light and moisture. Do not store in the bathroom. Keep all medications away from children and pets. Discard any unused portion from single use containers. Are you taking Vitamin K1 Ampul? Are you considering switching to Vitamin K1 Ampul? How long have you been taking Vitamin K1 Ampul?